I am down to my last little bit of baking powder, and I have squirreled it away it for particular recipes. For a cost comparison -- baking powder is between 3 and 5 times the cost for the equivalent leavening of baking soda and vinegar (YMMV depending on how you purchase your ingredients). This combo works well in muffins, cakes, quick breads, pancakes, waffles and some soft cookies (the kind that have at least a small amount of water, juice or milk in them) -- basically cake-like bakery items. 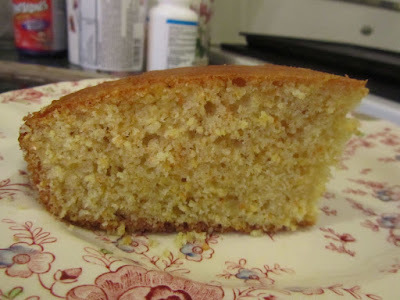 tender, cake-like cornbread -- crispy crust, but soft and cake-like inside. No baking powder, just used baking soda and vinegar, instead. Simply mix the baking soda into the dry ingredients and the vinegar into the liquids (any liquid, it doesn't have to be milk). 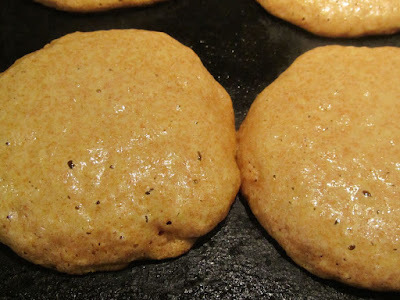 The leavening action will be short-lived and the dough or batter needs to be baked or cooked right away (into the oven within 4-6 minutes for most items, pancakes seem to be able to go longer). I have been using the baking soda and vinegar combination as my primary baking powder substitute for a month now, and have been very pleased with the results. The only trouble I had was remembering the amounts. So, I wrote the following down and taped it to the inside of my baking cabinet. If you're concerned that you will have an acidic taste to the final product, the baking soda seems to do a good job of neutralizing the acid in the vinegar. Try it for yourself. I haven't been able to detect any vinegar-y taste in my muffins, pancakes, cakes or quick bread. And remember, mix the baking soda with your dry ingredients, and the vinegar with the liquids in your recipe, then combine the two parts of the ingredients. UPDATE Just to let you know, it's now February 2014, and I've been using this baking soda/vinegar combination as my substitute for baking powder since August 2013. I've been very pleased with the results. And I found a plastic spoon in a drawer in my kitchen that measures exactly 3/4 teaspoon -- perfect for measuring the baking soda. I wrote a post on finding that spoon here. Gotta love those plastic fast food spoons. ANOTHER UPDATE It's now February 2015, and I still haven't bought any baking powder, but continue using this substitution formula! And an FYI, any kind of vinegar will give you the rise you want, just be careful about delicate flavors. The plainer the vinegar (white, apple cider, rice, champagne, white wine, and palm vinegar would be your most mild vinegars, and as well, they wouldn't color the batter of any item too heavily), the better tasting your final product. FURTHER UPDATE: It's now September of 2015, over two years since I began substituting baking soda and vinegar for baking powder in all of my recipes. I have not had a single baked good fail as a result of this substitution. 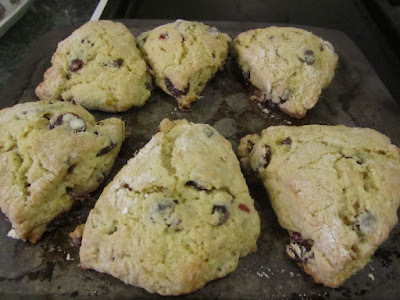 I've made cakes, biscuits, cookies, scones, cornbread, quick breads (like banana bread and cranberry bread), pancakes, muffins, waffles, dumplings (the kind that is a dough that you drop into a pot of hot soup). I've baked in the microwave, in a conventional oven, on the stove-top, on the griddle, in the waffle iron, and still no fails, not a one. I've made our special celebration cakes, like birthday cakes, the chocolate mini-cakes that I make for New Year's Day, an Easter cake, an apple-nut cake for Thanksgiving -- all using this substitute, I have so much confidence in its ability to turn out a high-quality product, and reliably leaven anything I choose to bake. I've served these baked goods to my family, brought to church picnics and suppers, served to my good friends over tea, and served to dinner guests in our home. I can hardly describe just how pleased I am with the on-going results I'm having using baking soda and vinegar to substitute for baking powder. It's just a matter of kitchen science. Commercial baking powder is a combination of carbonate or bicarbonate (baking soda) and one or more acid salts (such as sodium aluminum sulfate or monocalcium phosphate). Baked goods are leavened by an acid-base reaction which produces carbon dioxide gas bubbles, causing the dough or batter to expand or leaven. Commercial baking powders use chemical acids. In our home kitchens, we can substitute a food acid. Vinegar is one such food acid, of reliable strength (commercial vinegars must meet specific standards in the US, with regards to their acidity percentage), it's inexpensive and already in many homes. AND YET A FURTHER UPDATE: July 2016, and yes, I'm still using baking soda and vinegar in place of baking powder. It's a no-brainer at this point. It always works for me, saves me money, and I always have those 2 ingredients in the kitchen. Oh, someday, I'll get around to buying baking powder again, I'm sure. But for now, this works. SEPTEMBER 2016. I can't believe that it's been 3 years since I originally posted this. I get emails every week about this one post. Thank you! I love hearing about your successes. And I'm glad that some of you have now passed this info on to others. What was once my "emergency" substitute for baking powder has simply become my everyday "baking powder". Anyways, I continue to be pleased with this substitute. I hope you will be, too! Happy baking! NOVEMBER 2017. I post an update on this formula every so often. I still use this as my baking powder. I keep telling myself that I should buy some "real" baking powder. (You know, just so I can feel normal.) But I never do, and continue on with this tried and true substitute. I've honestly never had anything fail with this vinegar/baking soda substitution. I even bake special occasion cakes using this formula. My two daughters are now lovely, grown young ladies, and love to bake. They've memorized the proportions, too, and this is just a normal adjustment they make with baking, too. I've glad that you've found this, now, too, and can use this formula for baking for as long as you need. Happy baking!! If you've found this post helpful, please share. FB, pinterest and google+ are all great methods to help others find this info, too. Thank you! baking powder and baking soda are leavening agents in baked goods -- they produce gas which introduce tiny airy pockets into cakes. Without either baking soda or baking powder, for a cake, you'll need to find/follow a recipe which uses eggs as the leavening agent. Whipped egg whites, have air beaten into them, and then if you fold (carefully mix/blend/turnover until combined) the beaten egg whites into the flour, egg yolk, sugar, salt mixture, you'll retain the tiny air pockets made by beating the egg whites, even through the baking process. Let me quickly look up a recipe like what I'm talking about, and get right back to you. 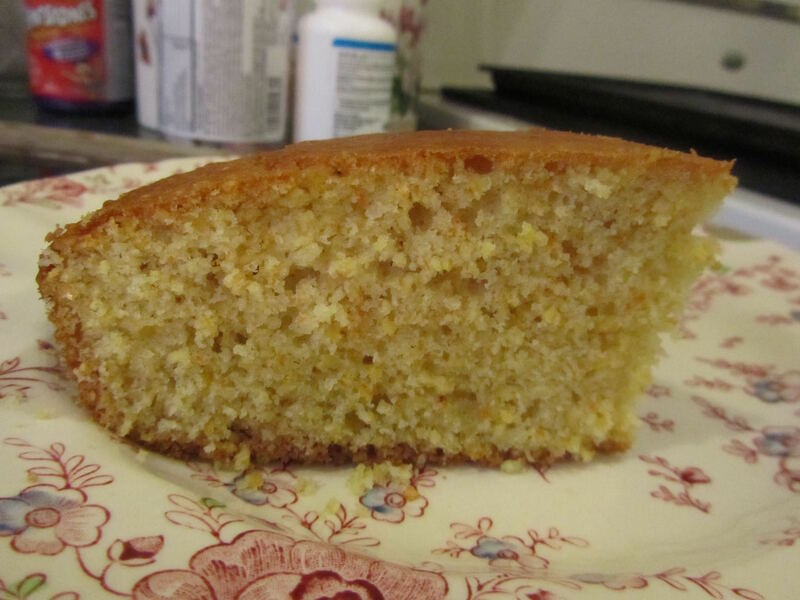 My advice would be to try a recipe for sponge cake, like one of these. Good luck with this! I've used it for about two years and I don't even purchase baking powder. However, I only cook oatmeal cookies and make pancakes so I am not a very big baker. However, I no longer have to worry about aluminum anymore. I have used this for two years without an issue. I pretty much only bake oatmeal cookies and pancakes. However, I have not had purchased baking powder in a year and a half. On top of that I use baking soda for other projects like cleaning. I know -- isn't it nice to know that you always have the ingredients, even if you don't bake often, and as a bonus, no aluminum. Thanks for sharing your experience. Another substitution for 1 teaspoon of baking powder is 1/2 teaspoon cream of tartar and 1/4 teaspoon of baking soda. I don't know how the cost works out though. That makes a great baking powder. If you add some starch, like corn starch, tapioca starch or arrowroot (to absorb moisture), you can keep a small quantity mixed up in an airtight jar for a month or so. That's the kind of baking powder I am currently running out of. (I did a post on the proportions in early July of this year). Cream of tartar runs between $11 and $15 a pound here, making a teaspoon of homemade baking powder cost me about 7 cents or so. My vinegar and baking soda substitute, for 1 teaspoon of baking powder equivalent is about 1 cent. And I have a lot of vinegar, now! Do you know how I think this tip could be really helpful, besides for someone like me, who is plum out of baking powder, but has vinegar and b.soda on hand. For a person with a small kitchen, and only wants to store a limited selection of ingredients. If you keep baking powder, baking soda and vinegar on hand, then you're storing one extra thing that maybe you don't need to store. Just a thought. 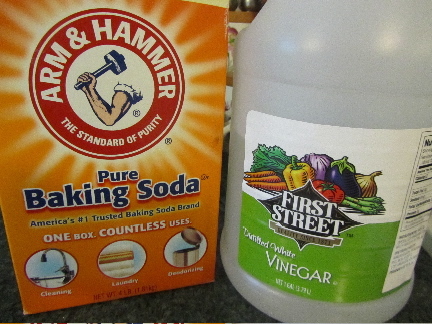 I have both a tight budget and a small kitchen but I always have large quantities of both vinegar and baking soda to clean with as well as cooking. I like the way you think!! Thank you, Doris! Always nice to find a kindred spirit! Awesome! I found you through my friend's pinterest page. Thanks for the info. Great! I still haven't bought any baking powder, and continue to use this vinegar and baking soda substitution. I was Googling ways of getting around using baking powder (part way into making a cake I realised I had tonnes of plain flour, no self raising or baking powder, eep!) and found this post. The cake is now just about ready to come out of the oven and looks the same as when I make the recipe with self raising flour. Thanks for saving the day! You know, I've done that too. Started a recipe only to realize half-way through that I was missing some key ingredient. We are so fortunate to live in a time with so much information available through the internet. Hope the cake was yummy! I'm so glad for you! Enjoy your cornbread! I was halfway through making cornbread to go with dinner when I realized that I didn't have baking powder. I found your page through google and it worked perfectly! My hungry & picky boyfriend didn't even know about my dilemma ;) thanks so much! I'm so glad that it was as successful for you as it has been for me. I continue to use this as my only "baking powder" and have yet to have anything flop. I made cupcakes just yesterday, using vinegar/baking soda in place of baking powder, and they turned out perfectly. Your cornbread is making me hungry! Has anyone tried using honey as a triggering (acidic) agent for baking soda? That's an interesting idea, for anyone with an abundance of honey, but no vinegar. I do know that molasses has enough acid to react with baking soda in recipes such as gingerbread cookies. I wonder if the acid content of honey is consistent enough from batch to bath, brand to brand, in the way that common vinegar sold in the US has to have 5% acidity, so as to prescribe a specific amount of honey in ratio to baking soda? FYI, Arthur, links within the comments, are prohibited on this site, and were stripped out by admin. Hello!! I ran out of baking powder the other day and almost put the brakes on my baking. I was so happy to have found your blog! I've made coffee cake (turned out AMAZING!! and baking powder biscuits (WOW!!) and am seriously considering completely switching over to BS+Vinegar. :-) I have to use Spelt Flour for my family and I've gotten used to recipes not turning out as they do with regular wheat flour. The BS+V mix works so much better than baking powder does with the Spelt!! Thanks!!! I'm so glad to hear this! And so interesting that the vinegar/baking soda works better with spelt than traditional baking powder. That's good to know! The amount of vinegar is so negligible, that I don't think you would even taste it. I have been using this substitute of baking soda and vinegar now for about 1 year, and so far I've been very pleased. I think the flavor of your chocolate or cocoa powder would overpower the small amount of vinegar, whether it's apple cider vinegar or white distilled vinegar. I wouldn't use any of the highly flavored vinegars, like balsamic or herb/fruit vinegars, but apple cider and white distilled work just fine. I have been looking for a baking powder substitute that fit into my very restrictive diet. I am doing the happy dance. Thank you for sharing. I'm so glad that this helps you! Enjoy your baking! I checked to see if there is a way to TEST if my baking powder is still good. I don't bake often and was afraid it might not be strong. Also need to know how to test yeast. the method I've used t check effectiveness of baking powder is to put 1 teaspoon of baking powder into about 1/3 cup of hot water. If it fizzes and gets bubbly right away, it's still good. Don't use cold water, the baking powder just won't do much of anything in cold water. To test yeast, put 1 teaspoon granulated sugar into 1/2 cup of bloodwarm water (about 100-115 degrees -- warm but not hot). Stir to dissolve sugar. Then add 2 1/4 teaspoons yeast (that's about 1 packet), stir well. Allow to sit for about 10-12 minutes. After 12 minutes, the yeast should be foamy, and the volume of yeast/water/foam should be doubled from the original 1/2 cup water. If it is foamy, you can use this "proofed" yeast in your recipe right then and there (just deduct 1/2 cup water from the liquids in your recipe). Would this work for a recipe that calls for both baking soda and baking powder? yes, definitely. I've done this many times. Just make sure to figure the baking powder substitution and ADD that to the required amount of baking soda in the recipe. Wonder if Balsamic Vinegar would work? We just moved and I'm missing so many different spices, but I have plenty of baking soda. Balsamic vinegar should work just fine. It may impart a tiny bit of the balsamic flavor, however. Out of plain vinegar will Balsamic make a difference? This is a good substitute for baking powder since baking powder contains some aluminum. There is a link between aluminum and Alzheimer's. See Dr. Mercola's recent article. This link has been around for a long time. Important to read labels. and yes, another good reason for my continuing to use the vinegar/soda substitution. Thanks for mentioning this. Yes, Aluminium.. Exactly the reason why I was searching for no-baking-powder (and eggless, as we're vegetarians) recipes. Heartening to know that vinegar-bicarb works for sweet cakes! And thank you for updating so many times with your results. Gives me the confidence/motivation to try it. here it is over 3 years since I first began regularly using vinegar and baking soda in place of baking powder, and I am still happy with the results. I'm glad to share this, as it is helpful for a variety of reasons. You said to bake right away but what is the recipe calls you to put the dough in the refrigerator for 1 hour before you bake!? I can't be certain, as I don't know what you're baking. But I can tell you this, I've baked cookie dough that use this substitution for baking powder, and that called for being chilled for an hour or two before baking, and had no problems. The cookies turned out fine. I've even kept cookie dough in the fridge overnight, and had no problems baking the next day. for 1/2 tablespoon of baking powder, use 3/8 teaspoon baking soda mixed in with the dry ingredients and 1/2 tablespoon vinegar with the liquids. Hope that helps! some measuring spoon sets come with a 1/8 teaspoon. If so, just use 3 of those. However, if your smallest measure is 1/4 teaspoon, you could use 1/4 teaspoon, plus half of another 1/4 teaspoon, that would give you 3/8, roughly. You'd have to eyeball the half of a 1/4 teaspoon, but that should work. Good luck! I'm all out of baking powder and vinegar! Will baking soda + lemon juice work? It should work. Some recipes call for molasses as the acid ingredient, so I would think that using lemon juice in the same amount that you would use vinegar, should work. Nattassia -- make sure that you mix the baking soda with the dry ingredients, and the lemon juice with the liquids. This works great. Baking powder was expired, but I made muffins successfully because of this site. Thanks! I'm so glad you tried the vinegar/baking soda combination. It continues to work extremely well for me, now almost 2 years later. This morning, I discovered I was out of baking powder halfway through mixing up the ingredients for banana bread and turned to the web in desperation. Your baking soda/vinegar substitution worked wonderfully. Thanks for the tip! I'm so glad for you! Yum! Banana bread is a favorite around here! I love this. Thank you so much for posting. I was out of baking powder and cream of tartar and in the middle of making banana bread and you saved it from becoming banana pound cake. This is now going to be a staple in my kitchen. I'm so glad to help! Banana bread sounds yummy! Thank you very much. I ran out of baking powder and I come across some baking powder substitution which calls for tartar cream (another fancy thing to possess since I'm not a frequently baker). Your simple substitution should work for me! I'm really glad this was of help to you! Thanks! Because baking powder contains corn starch used this substitution a couple of days ago when I made muffins for someone who has a sensitivity to corn. Muffins were delicious! Oh, that's so wonderful to be able to avoid corn with baking. Glad the muffins turned out well! I tried this substitute in my cornbread recipe and I must say that it didn't work for me. I didn't get the airy texture that I get when using baking powder. I did exactly as the instruction said to mix dry with dry, and liquid with liquid, and cooked it immediately after mixing. After reading the reviews, I will try the honey and baking soda suggestion. The bread is still edible, just not as good as I expected. I'm sorry the results weren't to your liking, using baking soda and vinegar. I hope you find a substitution that works for you. I'm excited to try this substitution with the vinegar method. I was wondering about mixing the wet and dry of baking soda and vinegar. I must have missed drys with drys and liquids with liquids. Thanks to the writer who mentioned it. this relationship. Hi there, it sounds like you're wondering if/when the dry and wet are mixed with regards to the baking soda and vinegar. By mixing the baking soda with flour and other dry ingredients, and the vinegar with the milk and/or other wet ingredients, you keep the chemical reaction of gas (bubbles) formation from happening in your mixture until all ingredients are combined and about to be cooked/baked. Enjoy your baked goods! Vinegar and baking soda really and truly works. It's an old substitution, used for years by many, many folks. What if the recipe calls for 1tsp baking soda and 1 tsp baking powder? Do I still add the first tsp of soda? you add the called for amount of baking soda, PLUS the baking soda and vinegar equal to 1 teaspoon baking powder, which would be an additional 1/4 teaspoon baking soda, plus 1 teaspoon vinegar. So, for 1 tsp b.soda, and 1 tsp. b. powder, use a TOTAL of 1 1/4 tsp baking soda, and 1 teaspoon vinegar (adding all the b.soda to the dry ingredients and the vinegar to the liquid). How much vinegar and baking soda do I use for 1 3/4 teaspoon of baking powder? for 1 3/4 teaspoon baking powder, you use 7/16 teaspoon baking soda plus 1 3/4 teaspoon vinegar. Since few of us have 16th measuring spoons, in this case I'd do an approximation, and make it a scant 1/2 teaspoon baking soda (that's where you fill the measuring spoon just a hair short). Hi.. I tried your baking soda and vinegar trick .. it worked great!!! My muffins are beautiful!!! I'm glad to hear that! Thanks for commenting and letting me know. Thank you for this substitution. I tried it this morning to make my family pancakes. They turned out wonderful like always, I could not tell the difference. I am going to definitely use this in the place of baking powder from now on. I go through so much baking powder and I am out AGAIN. So thank you so much for your post. I'm so glad you found this, then! I bake a lot, as well. A family of 5, so it comes with the territory! LOL! If a recipe calls for 1 tbsp baking powder, how much lemon juice and baking soda? I can't be certain, but this is what I know about substituting lemon juice for vinegar in other types of baking. In making meringue topping for a pie, you need twice the amount of lemon juice, than you do vinegar, as your acid ingredient to help the egg white whip up as light as possible. So, knowing this about lemon juice's acidity in comparison to vinegar, I would try using double the amount of lemon juice that I would use for vinegar. OR, for 1 tablespoon baking powder, I would use 3/4 teaspoon baking soda plus 2 tablespoons lemon juice. Remember, the lemon juice has to account for some other liquid in your recipe. So, you would want to decrease any other liquid by 2 tablespoons, to offset the liquid of the lemon juice. Really thanks for this substitute recipe. I'm concerned that some brands' baking powder has aluminium compounds in it, so this one is perfect. I know what you mean. There are a couple of brands which don't contain aluminum. But you do need to read labels to be sure. I'm glad to help, with this substitution recipe! you are THE BEST!! thank you for your continued updates. i'm going to try this BP substitute tonight for a pumpkin chocolate chip pecan bread. Oh yum! Pumpkin Chocolate Chip Pecan bread sounds delicious! I am trying to figure out the ratio here so I can make for other measurements. Is it safe to assume that the ratio is for every tsp of baking powder you use 1/4 tsp soda + 1 tsp of vinegar? So, if I need 1/2 tsp of powder, I would use 1/8 tsp soda + 1/2 tsp vinegar? And if I needed 1 1/2 Tbl powder, I would use 1 3/8 tsp soda + 1 1/2 Tbl vinegar? Basically, what ever amount I need of powder use that amount of vinegar and 1/4 of that amount in soda? Did any of that make sense? LOL! Makes perfect sense! Yep -- that's basically it. And that's the way I remember how much vinegar to use, as is it's always the called-for amount of the baking powder. That simplifies the math behind how much of baking soda and vinegar to substitute. And for the b.soda -- if you were to mix your own baking powder, from soda and cream of tartar, you would use 1/4 teaspoon of soda per teaspoon of baking powder that is called-for. Okay, I have to seriously thank you for this. I have celiac disease, and gluten free pancakes have the texture and taste of chalk and the consistency of shale (in your gut, it feels more like cement). But I went ahead and made some the other night anyway, but I lacked baking powder. So I googled substitutions, found this, used baking soda and cider vinegar, and those were the fluffiest pancakes I've eaten since being diagnosed five years ago. Thank you for posting this! I am so happy for you! You might find that biscuits turn out better/lighter with a GF flour with this substitution, as well. Thank you so much for your post! It's Christmas Eve and I wanted to make some quick breads for my relatives. I realized, though, that I only have baking soda, not baking powder. The breads look like they are coming out great! Thank you! Happy holidays! Merry Christmas! I'm glad to hear that your breads are turning out nicely! I just made baking powder biscuits with no baking powder (using this method) and wow! They are better than the originals with the baking powder. I wondered if they would work since the recipe also calls for buttermilk but they turned out beautifully and tasted great! There was no taste of vinegar at all! That's so good to hear. I think my scratch biscuits are also turing out fluffier, using baking soda/vinegar, instead of baking powder. I bake oatmeal cookies that have only two liquids: eggs and vanilla extract. Should I put the vinegar in the eggs and vanilla extract? Have you had anyone that has tried this with oatmeal cookies? In addition, there are many websites that offer conversion capabilities. You could just Google, “conversion measurements” or something like that. However, before going to any website make sure that you are using a rating service for unfamiliar websites like Web of Trust. I just made oatmeal cookies this weekend, in which the original recipe called for baking powder plus baking soda. My recipe called for 1/2 teaspoon of baking powder. It also called for 1 tablespoon of vanilla extract. What I did was put the 1/2 teaspoon of vinegar into the 1 tablespoon measuring spoon, then added vanilla to fill to the 1 tablespoon capacity. So, the vinegar became part of the total called for liquid in the vanilla (did that make sense?). My thinking is that with a full tablespoon of vanilla that subbing 1/2 teaspoon of vinegar for 1/2 teaspoon of the vanilla, the flavor would still be quite good (and it was!). With cookie dough, the egg is usually added right before the vanilla, so I don't think it would matter greatly when you added the vinegar, with egg or vanilla. That is a bit confusing because my recipe does not call for any baking soda. It calls for 1 teaspoon backing powder and one teaspoon of vanilla extract and two eggs. Are you saying that you cut the amount of vanilla extract and are adding the vinegar to fill-in the amount that you cut? Dee, yes, and it worked! You have a couple of choices, here. I think that because the amount of vinegar in your recipe is so small that it could be just in addition to the vanilla. So, I would use the 1 teaspoon vanilla called for, plus 1 teaspoon vinegar (for the acid in baking powder substitute) and 1/4 teaspoon baking soda (for the base part of baking powder). This should work just fine. But if you are concerned about the liquid of the vinegar, you could also try reducing the vanilla to 1/2 teaspoon (you would still get some of the vanilla flavor, just not as intense), and then use 1 teaspoon vinegar plus 1/4 teaspoon baking soda. This option would give you less vanilla flavor, but also 1/2 teaspoon less liquids overall. You could consider adding additional flavoring through another ingredient, like 1/2 teaspoon of ground cinnamon, or 1 tablespoon of orange zest, to compensate for the reduced vanilla. 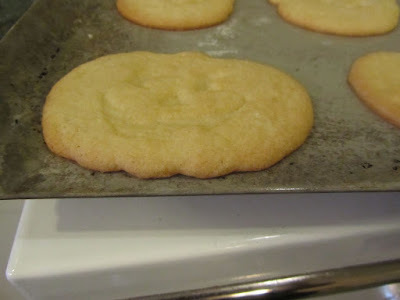 Drop cookies are pretty flexible in their recipes. An additional 1 teaspoon of liquid of the vinegar shouldn't adversely affect the final product. Either one of these options should give you good results. Dee, good luck with this. Let us know how your cookies turn out, as your results could help out another baker. Great! Looking forward to hearing your results! It worked fine. I screwed up the recipe by melting the butter. I left the butter in the microwave too long so they are not my normal cookies but the cookies didn't show any difference in the change of baking soda for baking powder. Now here is the interesting thing. I mentioned that my recipe does not call for baking soda but for baking powder. Wellllll, I looked at the recipe again and it actually called for baking soda, 1 teaspoon. I have been using baking powder for months instead of the correct ingredient, baking soda. Therefore, I used the conversion of baking soda for baking powder and it worked as usual. I also used apple cider vinegar and while the smell was pungent in the beginning; I can't taste any of the vinegar now. The recipe DOES NOT call for any baking powder. I should use my eyeglasses more when reading directions. Consequently, while I do not have to use baking powder for my cookie recipe, I fill pretty confident that this conversion will work for most of my other cooking needs, like pancakes, in the future. I'm very pleased with the outcome! I'm glad the cookies turned out fine. Don't feel bad about mis-reading the recipe. I have done that, too. I was making chutney, one year. I make it every other year, same recipe every time. Well, in 2 years time, my eye sight had gotten worse, and I wasn't aware of just how bad. I misread the amount on salt, and added 3 times what I needed. I realized this all towards the end. I wound up making another double batch, without salt, and combining the over-salted batch and the unsalted. But it was a pain to do. Now, I'm pretty careful about taking a cookbook to better light, if I'm not sure what it says. One of my older cookbooks has teeny tiny print, and it seems to be fading. Ha ha! The first time I tried vinegar and baking soda, in place of baking powder, I was a bit hesitant because I thought the vinegar flavor would come through, but it really doesn't, amazingly. I'm glad everything worked out! Yes, you can use part baking powder and part baking soda/vinegar. It will work fine. Good luck! Just tried this substitute in a hot fudge sundae cake because my son-in-law is allergic to corn, so he can't have products with baking powder that has corn starch. I didn't have cream of tartar around, but have lots of distilled white vinegar. This substitute worked out very well! Thanks! You have once again saved the day. I was making banana bread, and found that I was out of backing powder. Thanks for the tip. But I only need 1/4 teaspoon of baking powder...what ratio do I use then? for 1/4 teaspoon baking powder, you'll need 1/16 teaspoon baking soda and 1/4 teaspoon vinegar. Unless you happen to have a 1/16 teaspoon measuring spoon, you will need to "eyeball" it. Scoop a level 1/8 teaspoon into the measuring spoon, then, carefully, with a table knife, remove half of that. that will give you roughly 1/16 teaspoon of baking soda. There is such a thing as a 1/16 teaspoon measuring spoon, but it's not included in the most typical sets. Good luck with your baking! I hope it turns out yummy! I think your cookies will be fine without chilling the dough between rolling/baking batches. I've had great success with rolled out cookies, using this substitution, even though it can take an hour or more to do the whole batch. The short time window on the leavening, I believe is more important with a wetter dough or batter, such as for cakes. I hope this substitution works as well for you as it has for me! Anxious to try your substitution but I will be using potassium bicarbonate as I need to avoid sodium when baking for my mom with hypertension and heart failure. Will let you know how it works. I'm eager to know if this works with potassium bicarbonate, as well. I hope it does! Im glad I found this page, I was just trying to find a muffin recipe to use up granola and buttermilk and the one thing I used up already was my baking powder. I will see in a few minutes how this works. Those sound yummy, buttermilk and granola muffins. 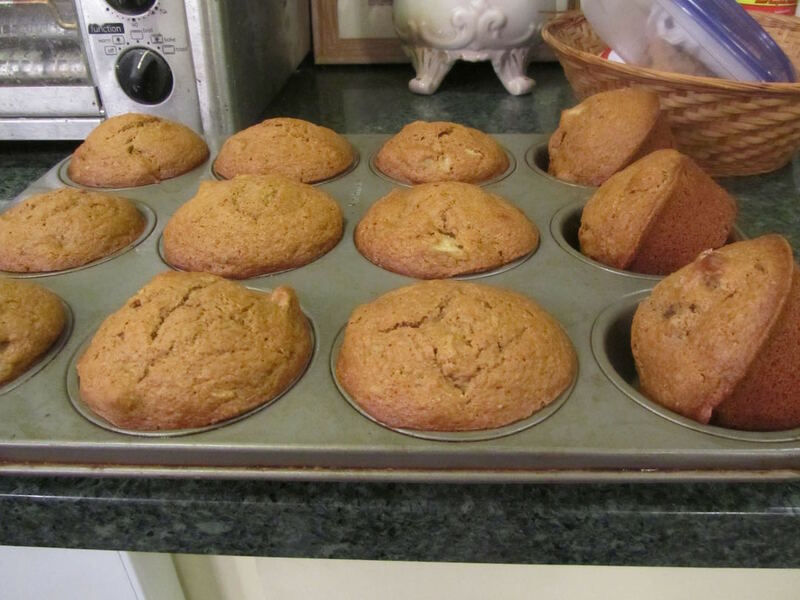 The baking soda and vinegar should work well in the muffins. Enjoy! Like so many others, I was out of baking powder and wanted to make something. Googling found your post. Thank you so much. I haven't tried it yet, but I will later today. In the past I have made baking powder with cream of tartar and baking soda and did not like it at all. To me, the cream of tartar/baking soda had an acidic-metallic taste in baked goods. I'll be interested to know if the taste is any less metallic, in baked goods, using the vinegar and baking soda. Good luck with this! I'm so glad! Yum! Blueberry cobbler sounds wonderful. I love this substitute. It's great to realize that I don't have to have baking powder, on hand. I hope you enjoyed the cobbler! I'm so glad this worked well for you! Enjoy! Hi lili, I was wondering, if I'm already using a tblsp of vinegar in my milk to make butter milk, should I still add the vinegar for the baking soda to activate or would the vinegar in the milk do it? Hi, sorry I didn't get back to you last night. Yes, you would still add the vinegar in the substitute. Think of the vinegar as the acid portion of baking powder (baking powder= acid + baking soda). Your recipe calls for both buttermilk (or buttermilk substitute) plus baking powder for a reason. I have a couple of recipes that call for sour milk plus baking powder. I use both the vinegar in making the milk sour plus the vinegar in creating a baking powder substitute. It works fine. Hope it turned out last night. Again, sorry I wasn't online, then. Oh no that's fine I wasn't cooking it last night. I just wanted you to see it for the morning but thank you so much for the quick reply! I'm about to make the waffles. I'll tell you how they come out! Thanks again. I'm glad you didn't need to know immediately! In the recipes that I'm familiar with that call for sour milk plus baking powder, the baking powder is not all that great an amount (compared to other baked goods that are similar). But the recipe also calls for additional baking soda. So, the recipe creator must have taken into consideration the baking soda plus sour milk, but also saw it needed more leavening so added a bit of baking powder. Hope the waffles turn out great! Cornstarch by itself won't work as an acid, to use with baking soda. The only time I've seen cornstarch in a homemade baking powder, when cream of tartar is used as an acid, plus the baking soda, and then the cornstarch is a filler or buffer ingredient. So, sorry, baking soda and cornstarch won't give you a substitute baking powder. Can you use the vinegar and baking soda combo? If perchance you were wondering if you could use cream of tartar and not cornstarch, the amount for 1 teaspoon of baking powder equivalent is 1/2 teaspoon cream of tartar, 1/4 teaspoon baking soda (and you can add 1/4 teaspoon of cornstarch, for filler/buffer, to keep the baking soda/cream of tartar from activating while in storage -- but the cornstarch is not necessary if you're using that substitute right away. This is a lifesaver! I am always concerned about additives in baking powder and bake with organic ingredients as much as possible. Today I'm making Mango-Banana bread, so I decided to use lemon juice instead of vinegar. The lemon will enhance the mango fruit. What's great is that using baking soda/vinegar or baking soda/lemon is so much cheaper than buying baking powder. In the past I've thrown out so much expired baking powder when I haven't baked for awhile. Thank you again for your excellent post! That Mango-Banana bread sounds delicious! I hope the lemon juice/baking soda works just fine for you. I'm not positive on the amounts for lemon juice, but I've guessed that the ratio should be greater for lemon juice to baking soda, than for vinegar to baking soda. Best of wishes with your baking! Hi, and thanks for doing all the heavy lifting in figuring out the right ratios of baking soda to vinegar! I'm interested in making baking powder-free waffles. I noticed in your 9/15 update that you had successfully made waffles with your substitution, but earlier you had mentioned that the action is short-lived and the batter needs to start baking within 4-6 minutes. Assuming you make more than one waffle, and each waffle takes a few minutes, how did that work out? Well, apparently, waffles do just fine with the vinegar and baking soda, despite what I've read about this combo being short-lived. So do pancakes, and it always takes me a half-hour to make a whole batch. Thanks Lili, good to know. Another question - do you have an opinion as to using lemon juice instead of vinegar? And if so, would you use the same ratios? I'm working within the constraints of a whole-food plant-based diet and, while vinegar is not strictly prohibited, lemon juice would be preferable. I'm not positive on the lemon juice amount. But I do know that when making a meringue to top a pie, that you use twice the amount of lemon juice as you would vinegar (the acid stabilizes the whites). That would be my guess, double the lemon juice, as vinegar. So, if your recipe called for 1 tablespoon baking powder, I would try 2 tablespoons lemon juice (in place of 1 tablespoon vinegar) plus 3/4 teaspoon baking soda. And remember the lemon juice has to be accounted for as a liquid, so decrease whatever liquid you're using by 2 tablespoons, like if it calls for milk, juice or water. If there is no other liquid, besides eggs/oil, then you could add a bit of extra flour, like 1 to 2 teaspoons of flour, for every 2 tablespoons lemon juice used in the baking powder substitute. Also, some folks prefer to use apple cider vinegar. Would that work for you? Apple cider vinegar is used in exact amounts as white vinegar. Dry, 1C each stone ground whole wheat flour and medium grain stone ground whole grain cornmeal plus 1/2t baking soda; wet (blended until smooth before whisking in with the dry), 2C soy milk (soybeans and water only), 1 oz dates, 2T unsalted/unsweetened sunflower seed butter, 4t lemon juice. That's it. These are not waffles to be trifled with, you could build a building with them, but they rose just fine in the waffle iron and the batter didn't expand noticeably in the bowl while it was waiting its turn. I served them up with sliced bananas and a strawberry-date coulis and as with many WFPB dishes I was skeptical at the first bite and totally hooked by the last. I'm so glad your waffles turned out well. And also glad to get feedback on the proportions of lemon juice to baking soda. So, big thank you! Those sound very hearty and chock-full of nutrients. I love what you used for a topping, too. That's the sort of waffle dish that's a whole meal in itself. Yum! Glad to help. Have a great day! I tried this. The result was flat, inedible pancakes. Should have waited to make pancakes until I could get to the store to buy baking powder. I'm sorry your pancakes didn't turn out. I have no idea why yours wouldn't turn out, when mine always do. No idea. Baking soda and vinegar is an age-old substitution for baking powder. It's worked for cooks for generations, so I can't imagine why it didn't work with your recipe. All I can think of is if you combined the vinegar WITH the baking soda, instead of combining the vinegar with the liquids, and the baking soda with the dry ingredients. Or if the batter was left to sit for more than a few minutes before cooking. That's all I can think of that baking soda and vinegar would cause flat pancakes, when your recipe otherwise always produces fluffy pancakes. It must have been very frustrating for you. Hi-- I'm an American in Russia right now and I was making pumpkin bread last night and didn't have any baking powder. So I used soda and vinegar just because it seemed like it would work. And it did, BUT...my pumpkin bread tastes sour-y, as if it had been made with strong buttermilk. I'm assuming this is because I didn't do the measuring right? If we're honest, I didn't measure at all, I just poured a little bit of the vinegar in. And, because I'd never done it before and wanted to make sure there was a reaction, I poured the vinegar directly into the soda, watched it bubble, and then poured the bubbly mess into the batter. On the bright side, I now know what to do if I need that sour buttermilk taste but I don't have any! Well, I think with many baked goods, they do turn out best if measuring the ingredients. For future baking, try adding the soda to the dry ingredients and the vinegar to the liquids. That will give your product a better rise. I haven't encountered any sour tastes, yet. Maybe yours was a case of too much vinegar, or too little sugar in the recipe. I don't know. I hope you found a way to enjoy it, anyways. One thing I do when I bake something that doesn't turn out as good as I'd hoped it would -- I use it in bread pudding, baked with egg, sugar and milk, or, I dice it, and smother it with cooked sweet milk pudding. I'm glad the vinegar/baking soda helped you out! I hope your oatmeal bake turned out well! Hi! Could you help me with figuring this out? If a recipe calls for 1 table spoon of baking powder and I want to use cream of tartar and baking soda, how do I convert that? to get the leavening of 1 tablespoon of baking powder, using baking soda and cream of tartar -- use 3/4 teaspoon of baking soda plus 1 1/2 teaspoons of cream of tartar. Thank you love saver tip! Thank you for posting this information! There are NO health benefits to use baking powder at all and there are dangers associated with the use of cream of tartar. Your substitution has been a hit at our home with the use of baking soda and vinegar. We use Apple Cider Vinegar for major health benefits. Thanks again for your post! I didn't realize there are dangers associated with cream of tartar. Thanks for that. I'll look into it. The vinegar and baking soda simply works, doesn't it?! I'm thrilled with it, myself. And so happy to share this info, as I know it is helpful, for a variety of reasons. I only need 1/2 tsp of baking powder. Plus you please help me with the soda/vinegar quantities? 1/2 teaspoon of baking powder = 1/8 teaspoon of baking soda plus 1/2 teaspoon vinegar. Mix the baking soda in with the dry ingredients (flour, salt, spices) and the vinegar in with the liquid (milk, egg, oil, extract). 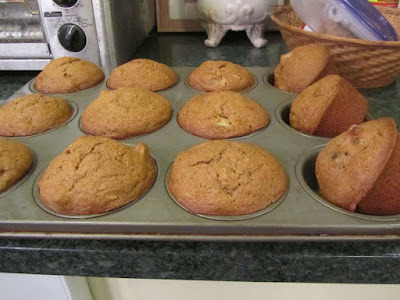 Thanks - just made corn muffins and it works! I'm so glad you found this tip helpful! Thanks for letting me know. Have a great day! Thanks for the tip- I'm on an extremely tight budget and was trying to figure out how I could bake some decent bread with the few ingredients I have available- I'll be trying this out tonight!! I'm glad to share this tip. It's been a very useful thing to know. I hope your bread turned out delicious! This substitute was great. Used it in pancakes. I'm from the islands and we use baking powder to make roti. Next time I will try it again then. So glad it worked for you!! Thank you for this baking powder substitution of baking soda and vinegar ratio. Have not baked in a long while. Have developed food and chemical allergies/reactions and have been stumbling for answers. Couldn't do regular baking powder because of aluminum, corn and sulfates. Have tried cream of tartar, baking soda and arrowroot - but still reacted. React to grapes so that's why cream of tartar might not be working. Chemically react to vinegar and react to apples, but can tolerate white distilled vinegar for cleaning. So I will try this combination of baking soda and white vinegar and try baking again. I'm very happy for you. I love the simplicity of this formula. Two very basic ingredients that I always have on hand. I hope your baking worked out well.